My drills have been performed by high schools and universities across the country. 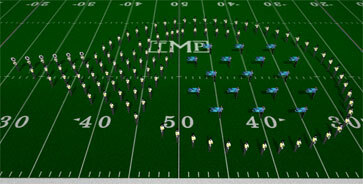 I've also been a featured drill writer for Marching Show Concepts and Center X Productions. All drill is written with PyWare 3D Java 9.0 and sent to you as Adobe PDF files. Student coordinate sheets are also provided as PDF files. Whether you have an ensemble of 30 or 300, your visual program will follow a logical and creative structure, not random blobs with the guard perpetually in an arc somewhere behind the band. Over recent years, I have been setting up private web sites for you and your students to download music, full drill charts, and coordinate sheets. These sites are password protected. Many directors utilize this in an effort to allow students to print their drill and music at home. Not only does this save you time in front of the copier, but it also encourages increased responsibility and a sense of ownership for the production and the band. I also provide vides synced with the music from the overhead perspective window of PyWare. This allows your students to be able to see the "big picture" ahead of time allowing them to have a better understanding of their responsibilities when they hit the field. Sample videos are provided below for your consideration. My number one concern as a drill writer is that the visual program is serving the music. That means that the appropriate instruments are staged so the balance of the ensemble is working for you, never against you. More importantly, the visual package should be just as musical as the notes that are being played. As a frequent judge in the Midwest and with the USBands, a constant frustration is seeing a program that has a solid wind book, an interesting visual presentation, yet there is no connection between the two. 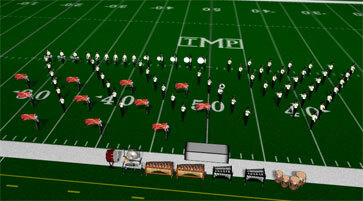 I look forward to speaking with you, your guard staff, and your percussion staff through the entire design process to ensure that all of the design elements of the show are coordinated into one consistent, logical, and musical presentation. Interested in reading more about the creative process for both music and drill? Looking for some impressions from somebody who judges around the US? Visit my blog for all this and more! Interested in talking about custom drill for your program? Great! Contact me by phone or click here to get pricing information. Listed below are fully animated samples of previous drill complete with the synth audio soundtrack. Right click and save these files to your hard drive for best viewing. Listed below are some fully animated samples of previous drills. These are complete songs animated at high speed to give you an idea of how a production flows from start to finish. Short pauses are inserted at holds. Right click (or click and hold for Mac users) and save these files to your computer for best viewing. Killingly 2004 | "Bells" (closer from "Twelve Nights"
Click here to download a 5 page sample of full drill charts. Click here to download a 5 page sample of the student coordinate sheets.